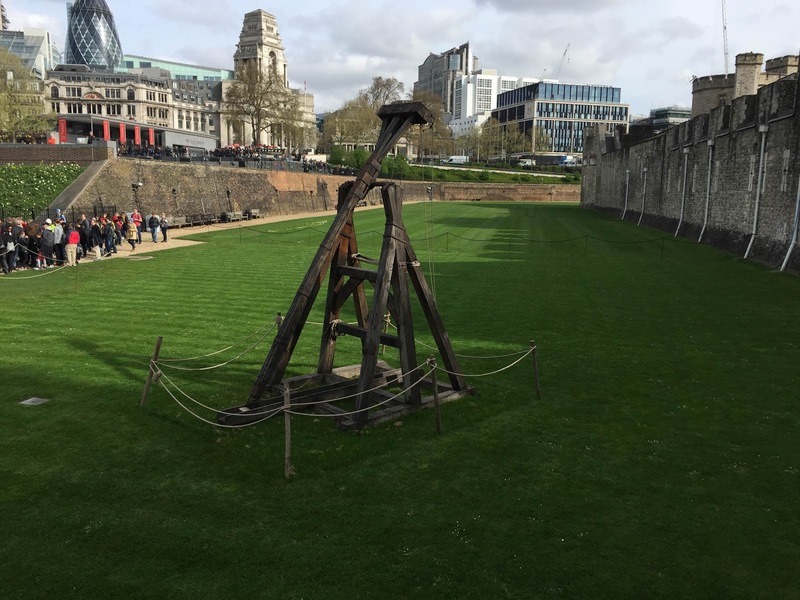 In my last post, I hinted that the tour of the Tower of London was "darker." In some respects, that's absolutely true, because of the tower's history. 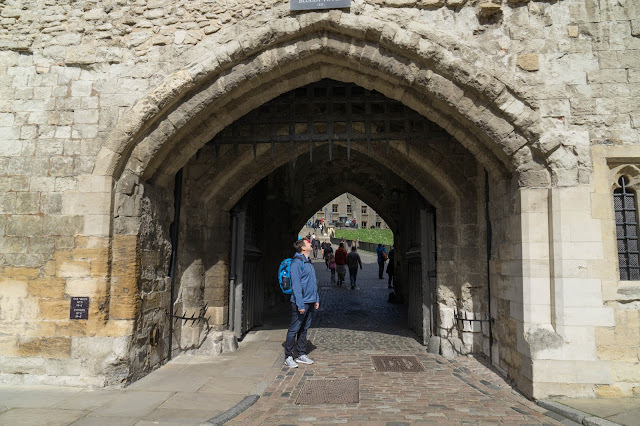 The day itself dawned sunny and bright, and we made our way early to the Tower of London. There was already a line by the time we got there. There was a group of visiting students in line ahead of us, from Canada. These were not the only travelling student groups we saw in London -- there was at least one more group from Spain, and another from France. 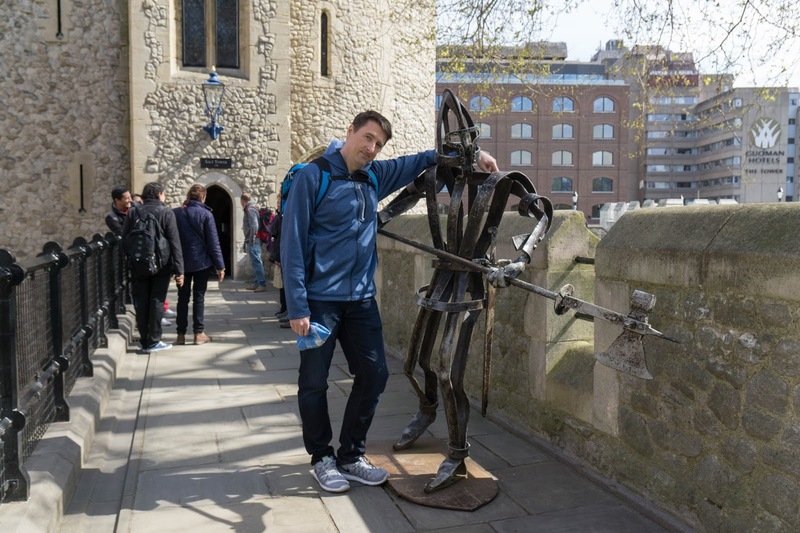 London attracts tourists of all kinds, but is especially popular with student groups because there's so much to see and study. But I digress. We were quickly admitted to the tower and went promptly to find the guided tour (as is our wont). The first one was already full, so we decided to try again at the next prescribed time. Tours to the left, quick exits to the right! The good news about missing the first tour was that it gave us a chance to toddle around a bit. We decided to go see the Crown Jewels. So small a line we never did see! We were actually very lucky to get there early, before everyone else realized there was no line. We got to go straight in and loiter a bit at each exhibit. The following statement should NOT surprise those of you that have been following these escapades so far: NO PHOTOGRAPHY was allowed inside. They claimed it was for copyright and security purposes, primarily. I can't imagine anyone would actually try to steal the Crown Jewels, but better safe than sorry, I suppose. 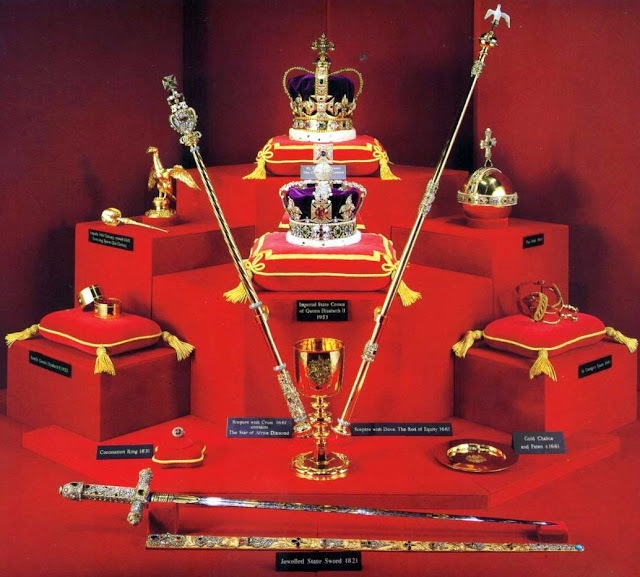 The Crown, Sovereign Orb, and Sceptre. A collection of a tiny subset of the jewels. These two photos don't tell the story at all, not by a long shot. The enormity of the collection was such that you are left with the thought "surely, these are fake... these just can't be real." Well, they are, most definitely, real, and very much worth seeing. The trick, as before, is to find a time when the line is short. We were later told that the average line to see them was an hour or two long. Yikes! 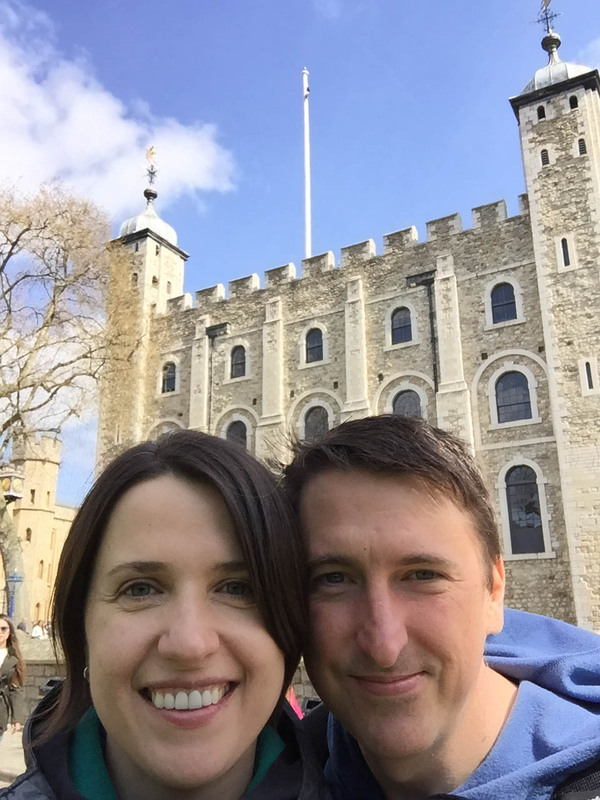 After seeing the crown jewels, we went up into the White Tower. We weren't sure whether or not photography was allowed, so we risked a couple of photos. 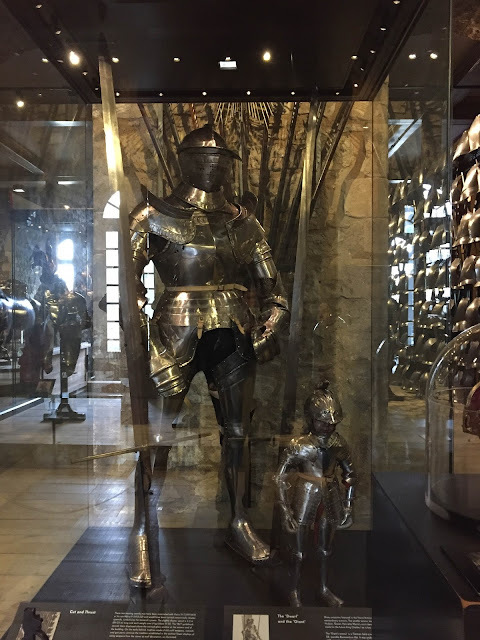 The story behind this was that the small armor belonged to a dwarf in one of the courts, and the large armor belonged to a very large German knight, but those are unconfirmed. It, of course, reminded me of Game of Thrones. 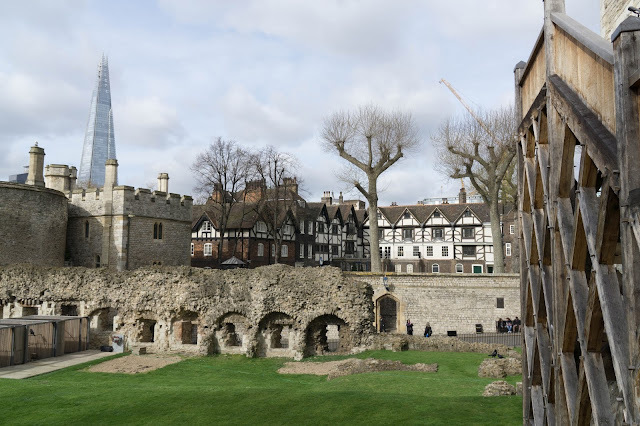 There's a short tour of the upper level of the White Tower that is separate from the main tour of the tower grounds. The guide confirmed that the places we were about to visit were off limits to photography. Drat. The most interesting place on that tour is St. John's Chapel. Several members of royalty spent their last evenings in prayer here, before heading to the executioner's block. 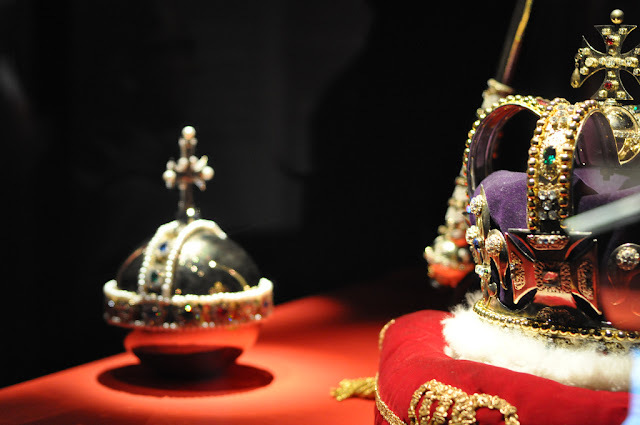 Other royalty were married there throughout the ages. The chapel is still operational, as it has been for the past thousand years. This concept is simply lost on my American mind. There's virtually nothing in the U.S. that is operating almost identically to they way it was a thousand years ago that's not a force of nature. 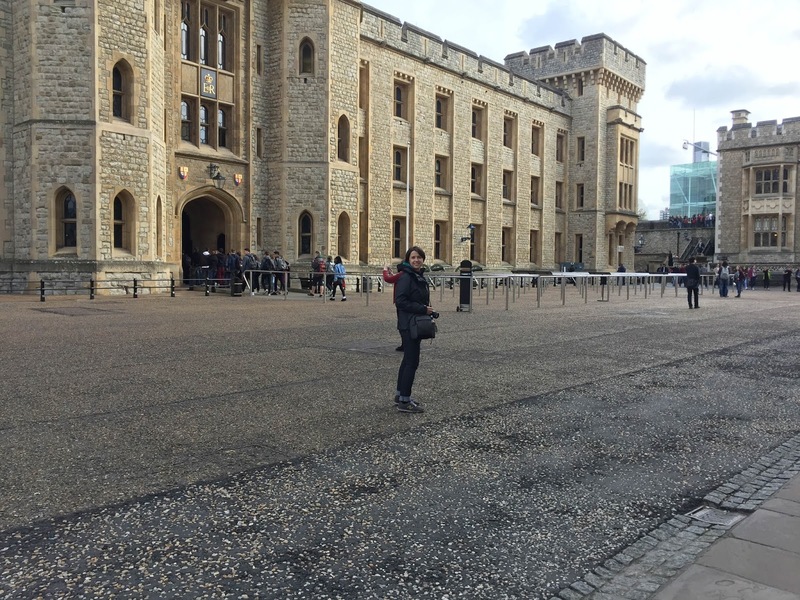 After this, we made our way back to the main entrance for the Yeoman Warders guided tour. In case you were wondering, Yeoman Warder is the formal designation for Beefeater, which you might be more familiar with. In any case, the guided tour is completely worth the time and effort. I really wish I could remember this gentleman's name, because he was vastly entertaining and informative. 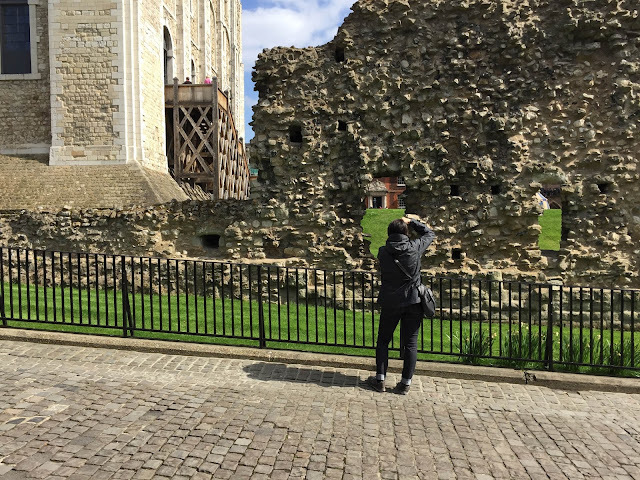 He took us all over the grounds, telling us vividly engrossing stories of the history, both dark and light, of the Tower the entire time. 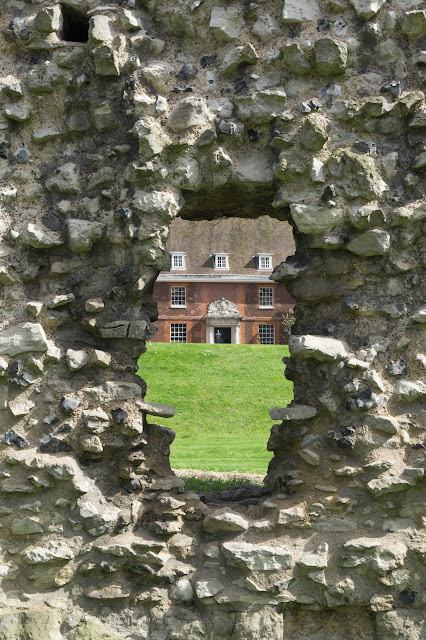 The moat was originally designed such that it rose and fell with the tides. As such, it was used for waste disposal (just like every other part of the Thames). The theory was that the tide would pull all of the waste out of the moat and wash it out to sea. When the Duke of Wellington (remember the guy from St. Paul's?) finally had it drained in the 1800's, he discovered that the theory never actually worked, and that the Tower of London was surrounded by Europe's largest cesspool. They filled it in as quickly as possible. The Tower of London has been many things -- defensive fort, prison, a mint, and a menagerie. 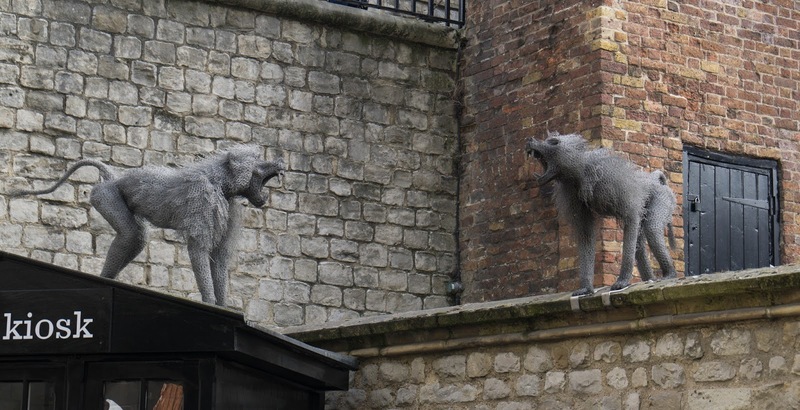 There are several animal sculptures scattered around the tower to remind you of that fact, including this one. WARNING! GRAPHIC CONTENT! Of the less than stellarly-performed executions, there's the story of when the executioner couldn't perform his duties and the local butcher was called upon in his stead. Unfortunately, the butcher was not very handy with an axe, and after taking several swipes, resorted to using his butcher's knife to finish severing the poor soul's head. 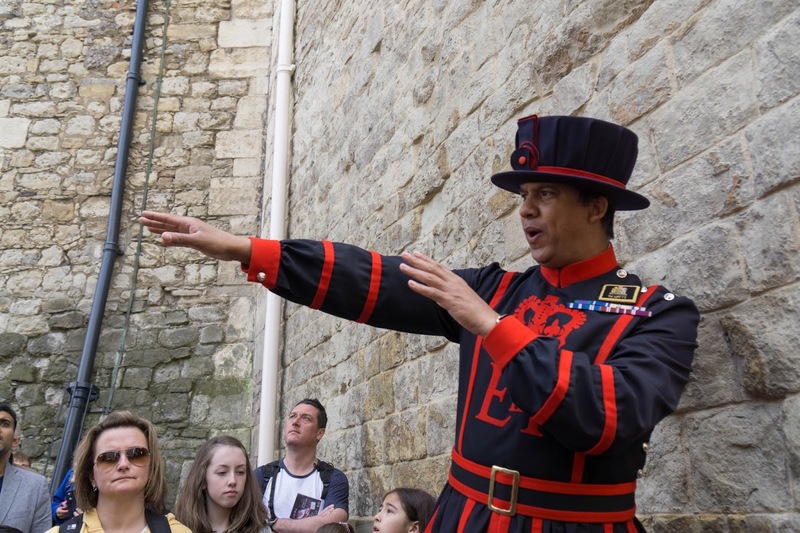 The yeoman told this last story with such detail that someone in the audience actually fainted. I never saw who, but my understanding is that it was either a young girl or her father. Delicate English sensibilities, no doubt. One other note about the yeomen and the other guards at the other places I've mentioned so far. These folks are real soldiers, most of them veterans of some sort. The ribbons they wear are all earned. The yeomen, specifically, have a pretty long list of requirements that aren't easily achieved. You have to be a veteran of at least 22 years, be a warrant or senior non commissioned officer, and have earned the Long Service and Good Conduct medal to even be considered. That already narrows the pool quite a bit. 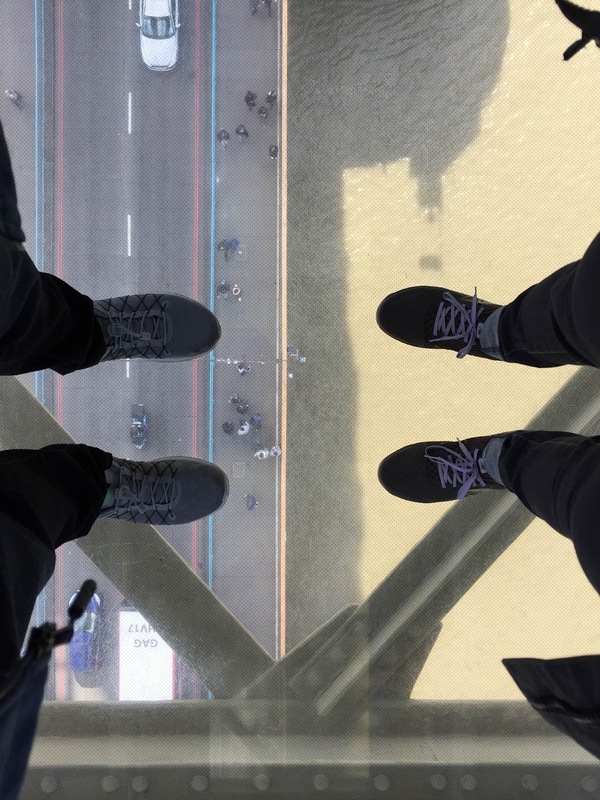 Here are a few more pics from the Tower, before we move on to the bridge! That wall has stood for almost 1,000 years! The portcullis of the gate of the Bloody Tower. Heavy, man! 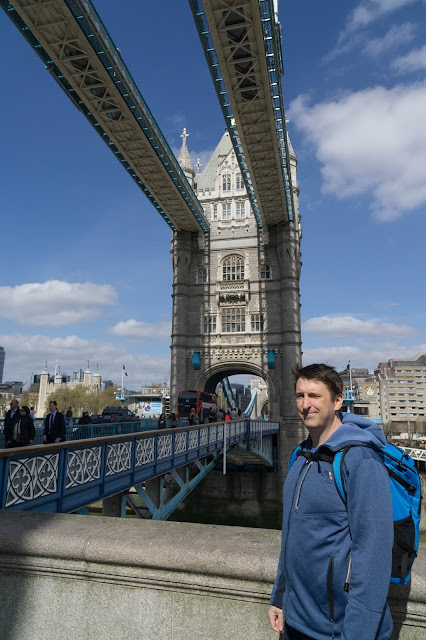 Tower Bridge, as you might expect, is the bridge across the Thames that is closest to the Tower of London. It's special in that it's a bridge built in two styles: part suspension bridge, part drawbridge. It also has two towers built on it, between which is an observation area with a clear floor. Look! A bridge with a tower! It's probably London Bridge, right? The trip through and around the bridge is actually pretty quick. The most interesting parts for us were in the observation area, of course. There are parts of the floor that are transparent, so you can see just how high you are and what's going on below. I'll bet it's pretty neat with the bridge is drawn and some big boat is passing under. So far above the teeming masses! 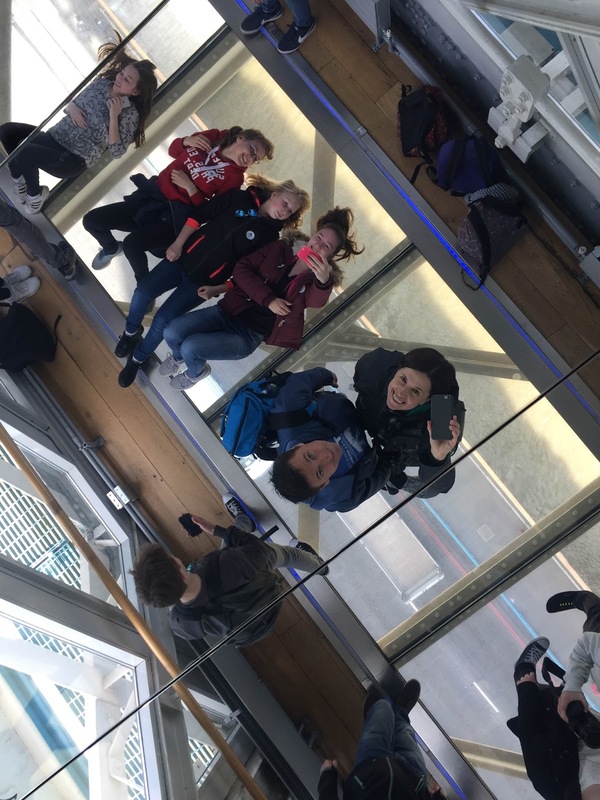 They also have mirrors on the ceiling, so that you can take pictures of more than just your feet. It was kind of amusing to watch people that were so accustomed to taking selfies try to figure out how to use the mirror to take a good picture. Most of them gave up and resorted to selfie-ing. Mirrors are useful, especially when you don't have a selfie stick! We skipped one part of the tour through the bowels of the bridge's machineries, but didn't feel like we'd missed very much. Plus, we needed to prepare for an evening of drinking and shenanigans. You see, I was about to get together with people that I've known for twenty years or so, but haven't seen in quite some time. In fact, one of them I'd never met in real life at all! Approximately twenty years ago, during the age before Facebook or Twitter or even MySpace, the way you enjoyed society on the Internet was either through IRC, or through Bulletin Board Systems (BBSs). If you're unfamiliar with what these are, reddit.com is a modern-day BBS. I was a huge fan of the Ultima computer RPG series, and the final edition of that series was in the works. Using Lycos, the best search engine of the day, I sought out other like-minded individuals that might have started some discussion on the topic. The place I came across was Horizons Tavern. Being a part of this social group had a significant impact on me. I met several people that became excellent friends, and that I'm still in touch with to this day. I sincerely hope that each of you has a group of friends (virtual and/or otherwise) that always provide stimulating and diverse topics for conversation and commentary, and that you can count on to be thoughtful and fun at the same time. Ah, nostalgia. A small group of these folks live in/around London, so we had agreed to meet up at the Glasshouse Stores pub for a night of revelry. Well, not so much revelry, as drinking and chatting and laughing. 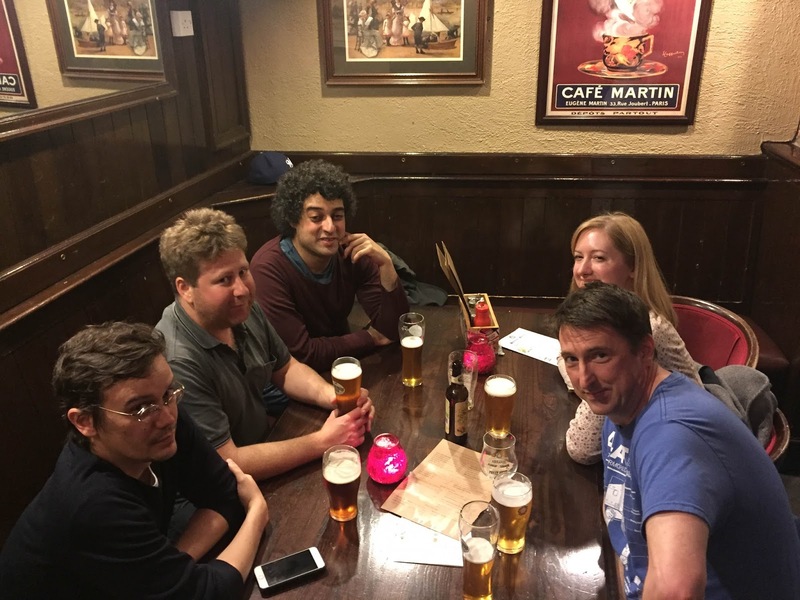 We met early, because you're allowed to start drinking pretty much as soon as you step into a pub in London, and I like beer. We sampled the wares, talked and laughed and drank until well into the evening, and eventually parted with promises not to wait another twenty years before getting together again. Drinking after a hard day of Towering was absolutely the right way to end Outing #5. It left us in the right frame of mind for Outing #6, where we FINALLY made it to Westminster Abbey. Be on the lookout for that!